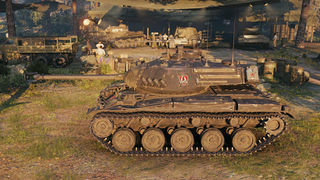 Der leKpz M 41 90 mm GF ist ein deutscher premium leichter Panzer der Stufe 8. Deutsche Ausführung des amerikanischen leichten Panzers M41A1 Walker Bulldog. Unter anderem wurde das 76-mm-Geschütz M32 auf 90 mm aufgebohrt und um 425 mm verkürzt. 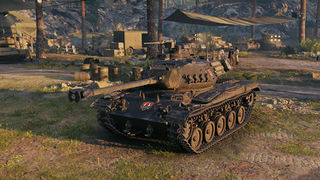 This tank takes some of the best attributes from the T49, Ru 251, and the Bulldog and combines them all to create a very versatile light tank that can load its HEAT shell and go after some of the bigger tanks in the game, or can load up its HEP and chase down a WZ-132, or even load AP and perform a sniping role. However, this tank does have its limitations as your HEP shell will almost never work against a T54 lightweight. 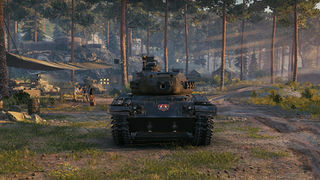 You can also count out any chance of a random bounce here and there, as it has a max of 25mm of armor and if you're fighting a T49 or M41 90 you're better off staying side-on and hoping your tracks block their HEP shell.